"The entryway of a boutique hotel seems like an unlikely location for conversations about food insecurity or advice on the benefits of eating more vegetables. But these are the issues being tackled each Monday during Lunch Agenda, a new online radio show broadcasting from the LINE Hotel." The full article is here, check it out! Speaking of lucky number 3, today's guest on the show was Philip Sambol, who this week celebrated the third anniversary of his Good Food Market being in business. I asked Philip about how his grocery business, which will open on South Capitol Street in the Bellevue neighborhood of DC's Ward 8, will soon offer an alternative to the traditional big box model. 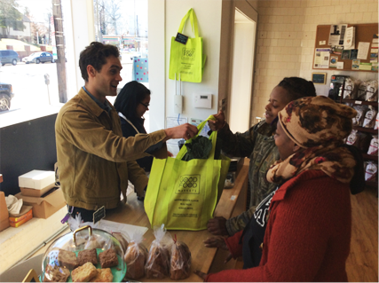 Philip Sambol serving guests at his first Good Food Market on Rhode Island Ave. NE. "We're not coming in to make it safe for people. We're coming in to offer a service to a market that already exists. Good Food Markets operates on existing demand. We're not counting on any other change to take place." "Vote, okay? !...Here in DC our council members are super committed to these issues. Vote, support the candidates who are in support of a sustainable food system that's equitable, and pester the heck out of the ones who aren't to get them on board."